Serving Northwest Arkansas for over 125 years. Moore's Chapel is a historic landmark established in 1889, Moore's Chapel has served Northwest Arkansas families for over 125 years. And though many things have changed over the decades, the founding principals have not. As a family-owned and operated business, our commitment is to provide families in the Fayetteville and it's surrounding communities dedicated support, personalized service, and exceptional care. We are committed to helping you and your family with sound advice, respect, and attention to detail. Just like it was in 1889. Moore's Chapel was established in 1889 by J. Frank Moore (pictured left). Mr. Moore sold the firm to A.D. Callison who later sold to Morton Carnes and Randall Roberts. Mr. Carnes and Mr. Roberts owned the funeral home until 1987 when it was purchased by Tommy C. Mills & Jim L. Garmon. In 2010 the firm was purchased by it's current owners, Scott & Paula Berna. Together Scott and Paula feel blessed to offer their focus, empathy and guidance to families as they celebrate and honor their loved ones. 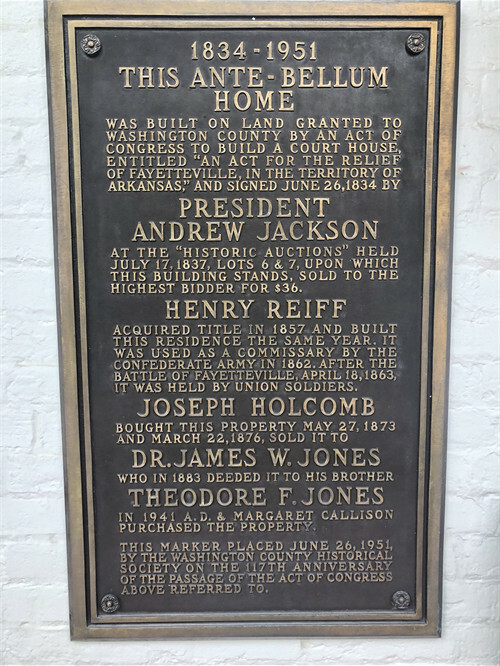 This Ante-bellum home was built on land granted to Washington County by an act of Congress to build a courthouse, entitled "an act for the relief of Fayetteville, in the territory of Arkansas." and was signed June 26, 1834 by President Andrew Jackson. The marker pictured below was placed on June 16, 1951 by the Washington County Historical Society.